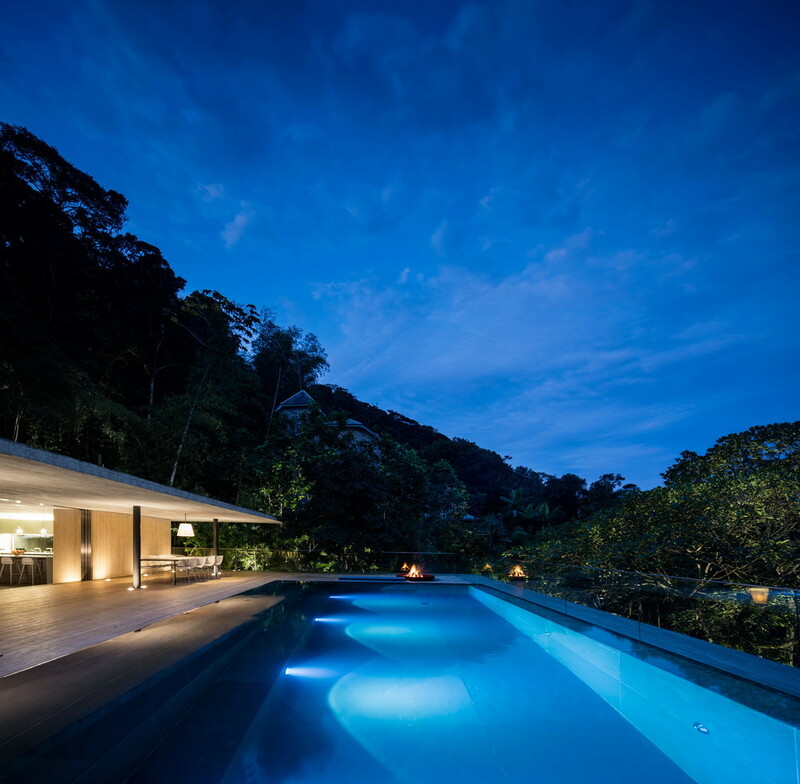 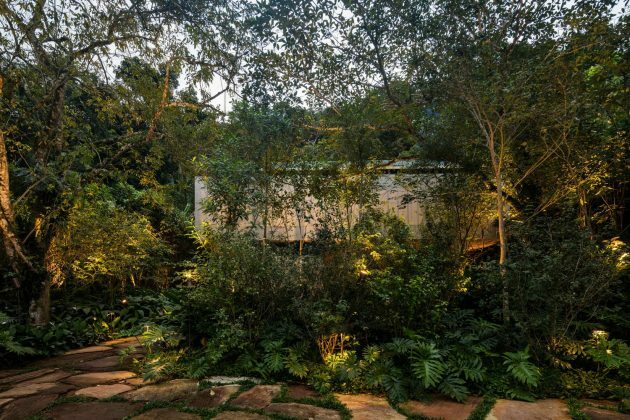 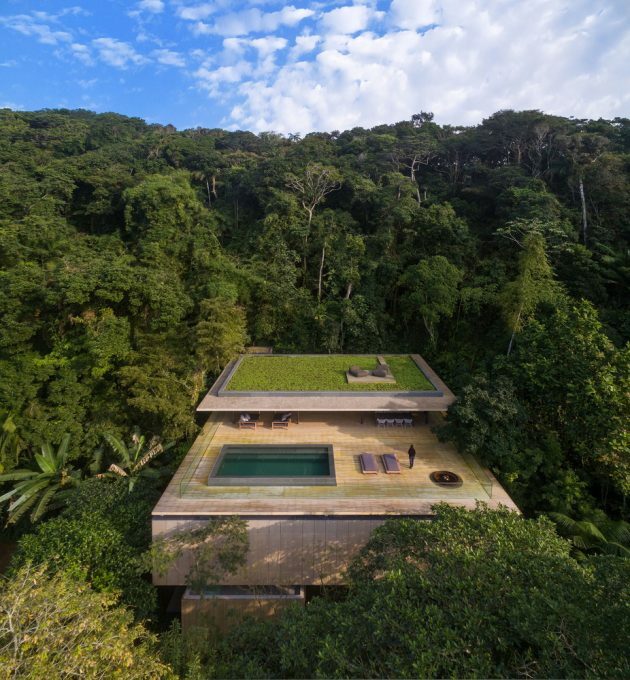 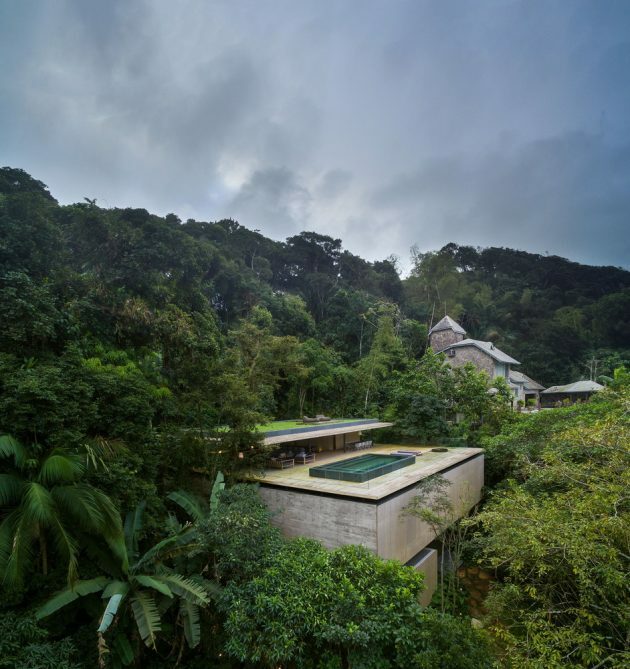 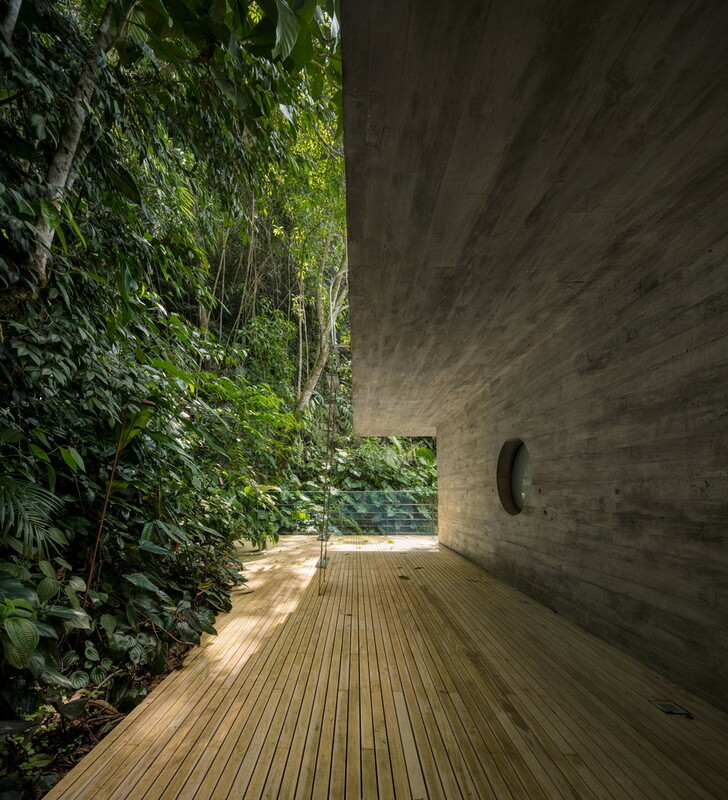 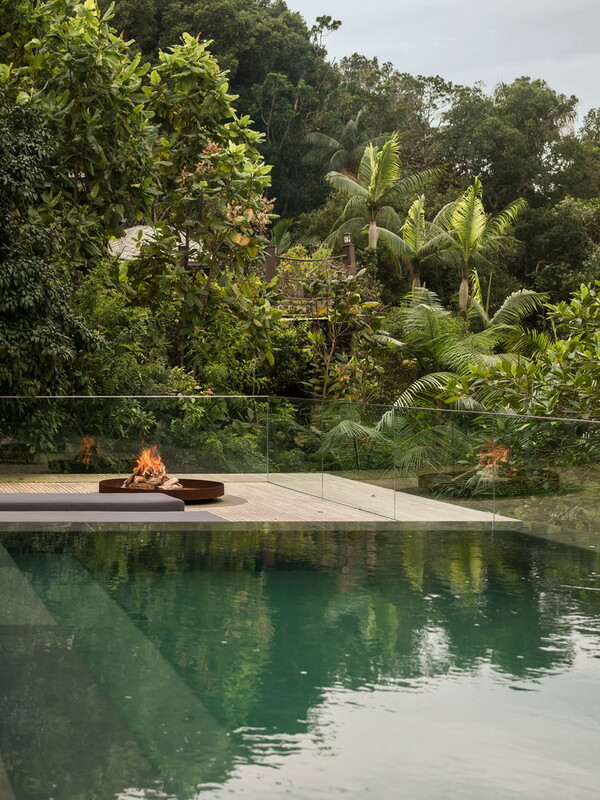 Casa Na Mata or The Jungle House is a stunning home nestled in the dense vegetation of the Brazilian rainforest. 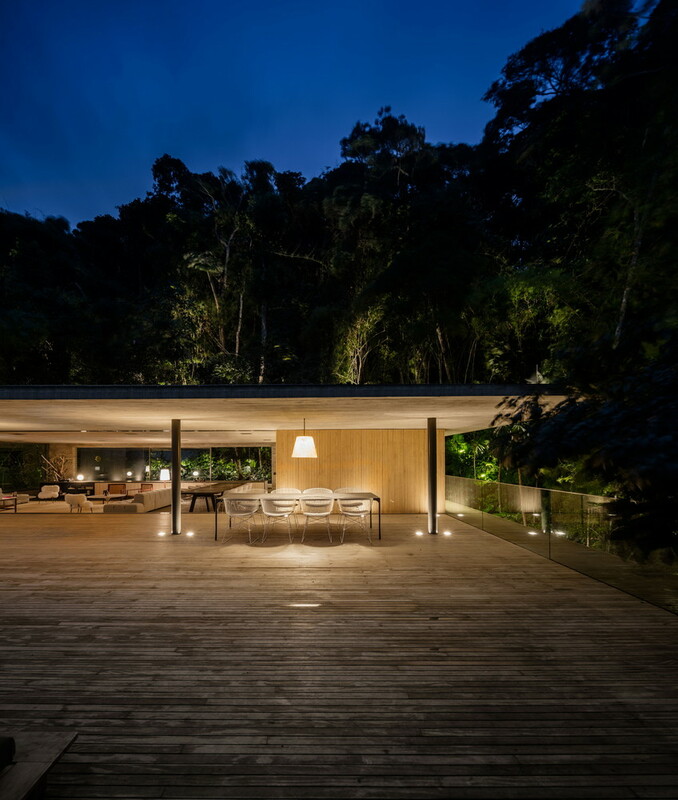 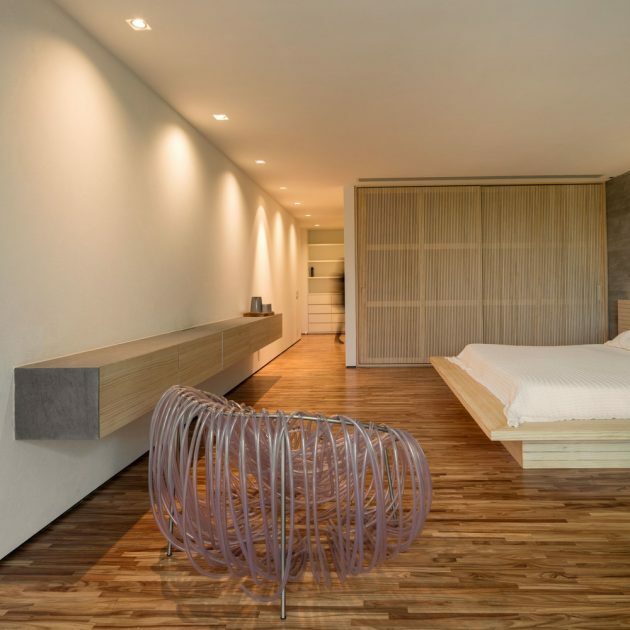 It was designed by Studio MK27 and is located just west of the Paulista shore. The design attempts to bring nature and modern living closer together. 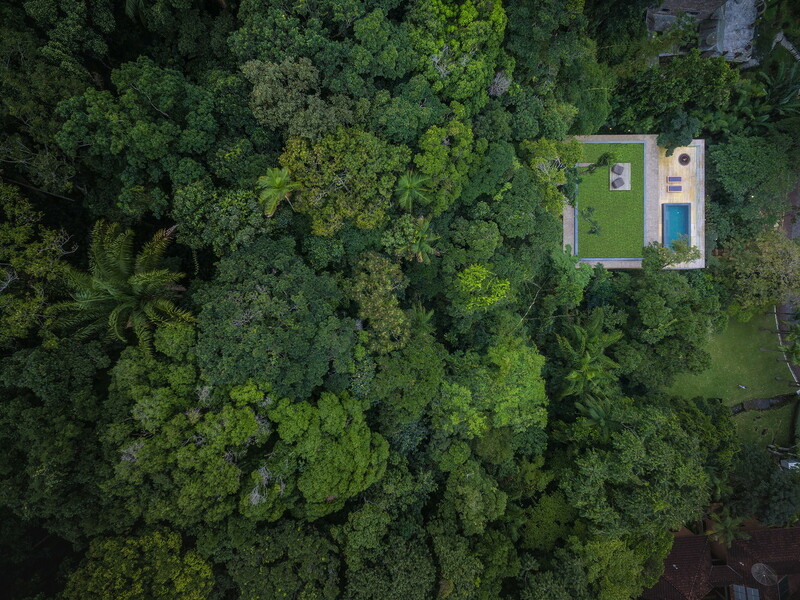 Sitting high above the treeline on the side facing outwards, the home enables a stunning view towards the shore while behind the house, the trees that sit high above give the impression that the house is naturally set in the landscape. 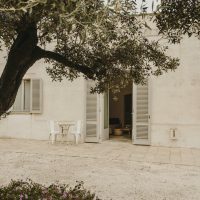 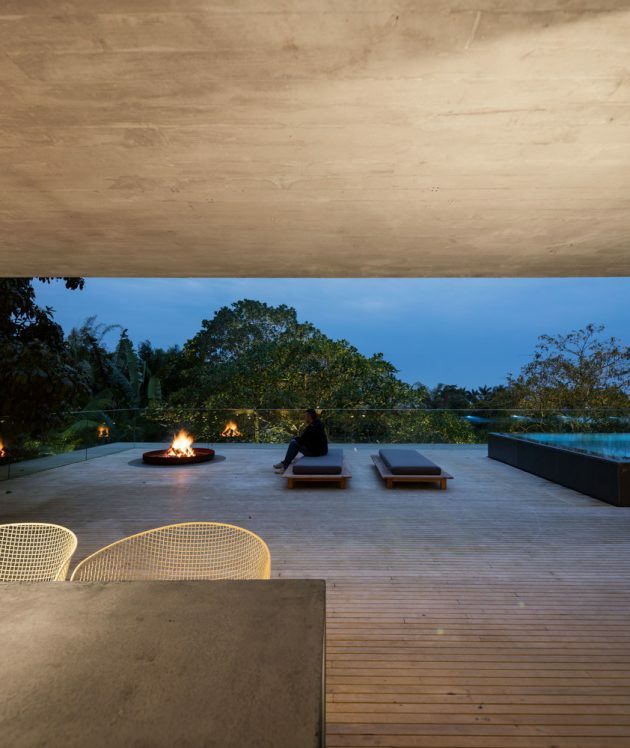 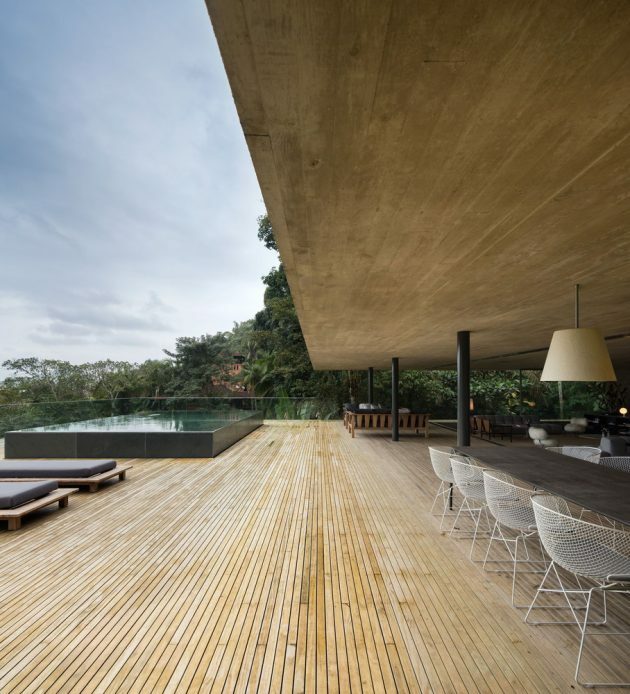 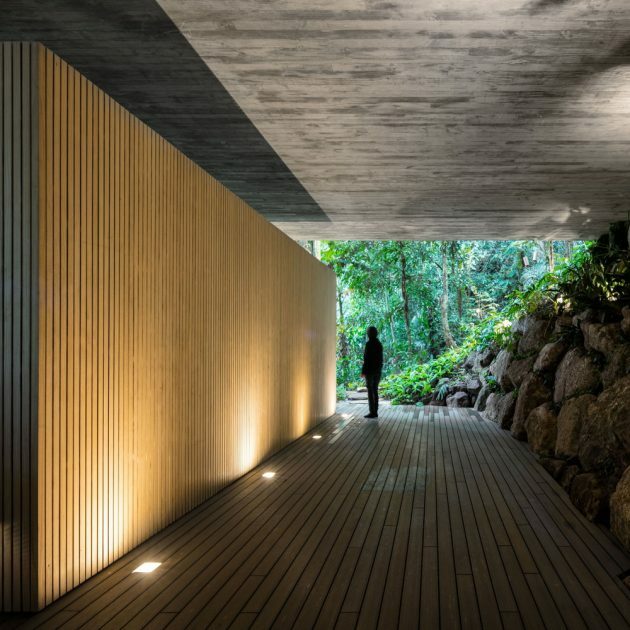 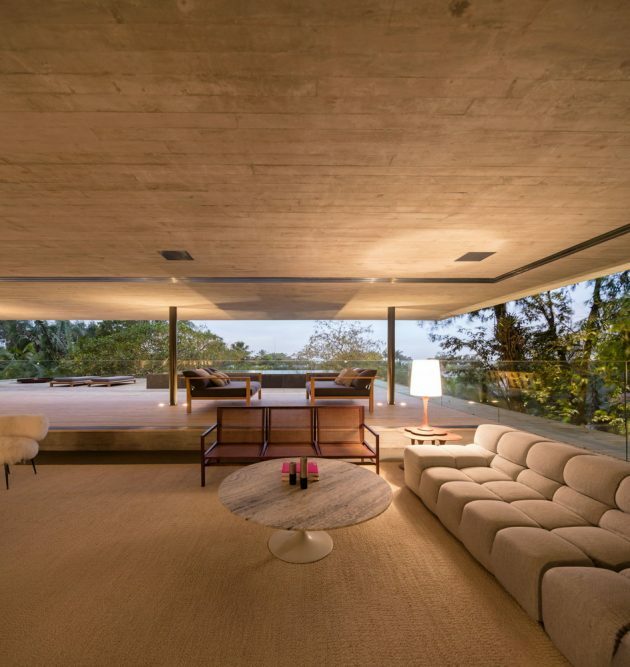 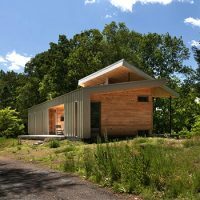 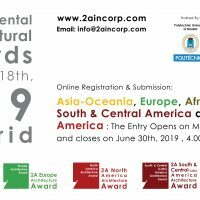 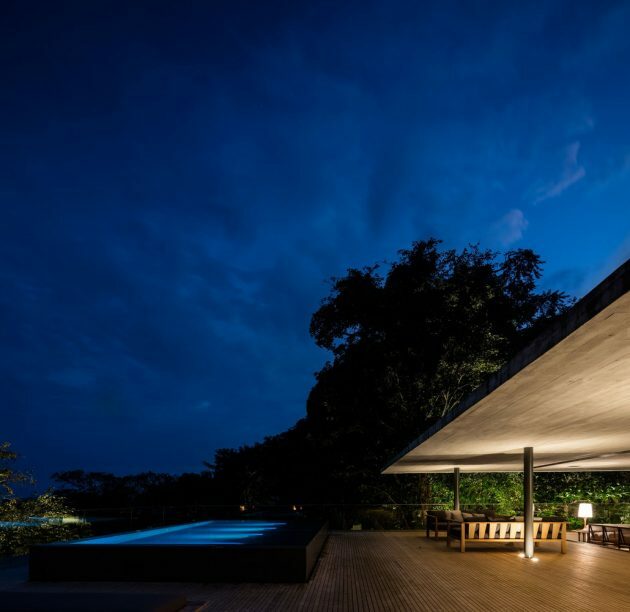 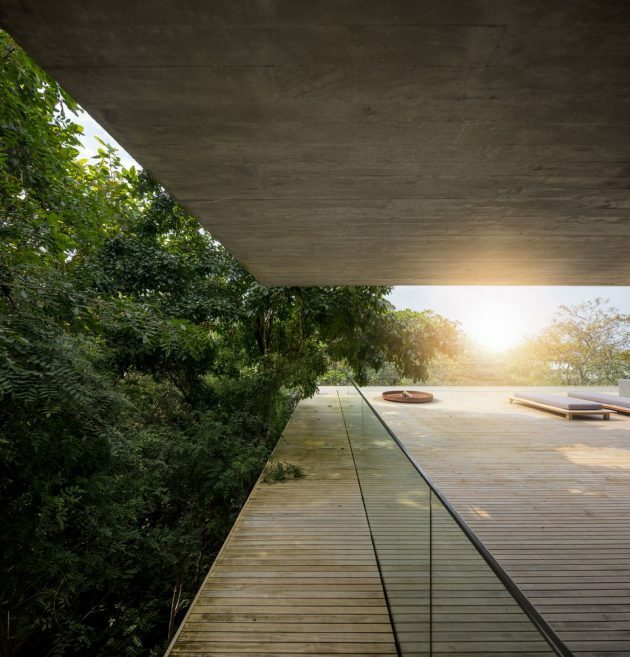 of this house to this landscape has the objective of optimizing the connection between architecture and nature, privileging the view looking out to the ocean and the incidence of sunlight in the internal spaces. 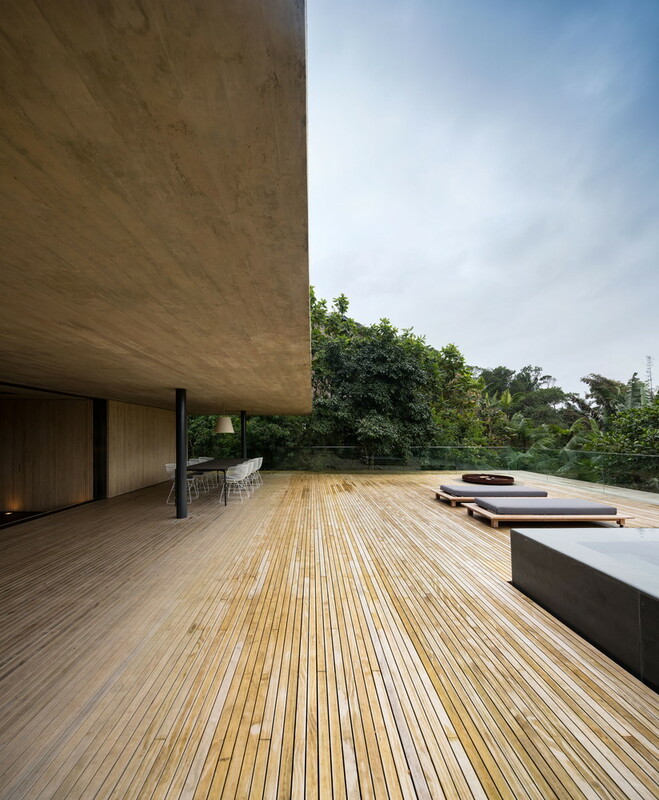 Furthermore, the positioning of the house on the site obeyed the previously-open area in the vegetation. The main volume of the house is elevated from the ground and seems built into the topography. The house, therefore, projects itself out from the mountain. The contact elements between the slope and the construction – as for example the wooden decks — were shaped to respect the existing land, thereby creating an organic interaction between nature and the architectural elements. 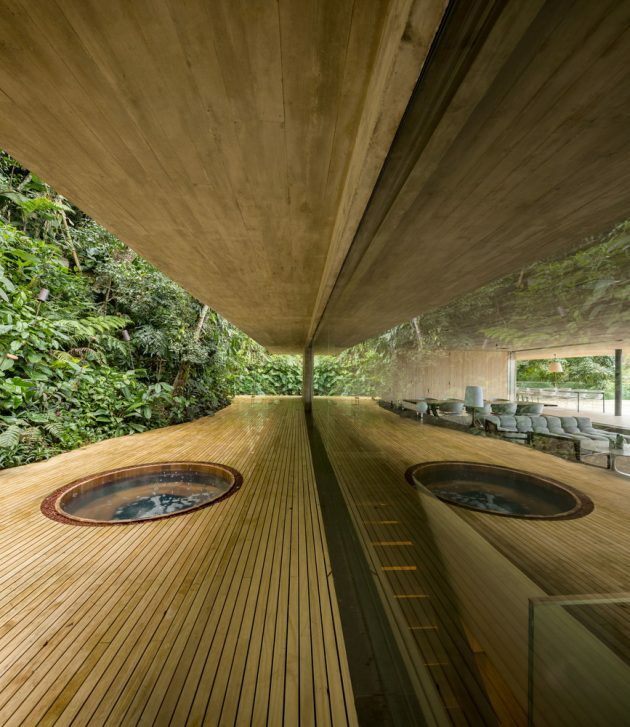 In the part that it comes out of the mountain, the structure touches the ground with only two pillars. The 3 floors of Jungle House create a clear programmatic division for the project: the ground floor houses a large covered wooden deck, connected to a small room for the children; on the first floor there are six bedrooms — five of them with small verandas with hammocks – and a tv room; the third and last floor is the social area of the house, including a swimming pool, a living room and the kitchen. 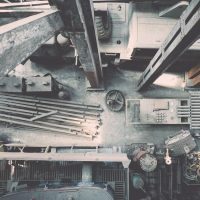 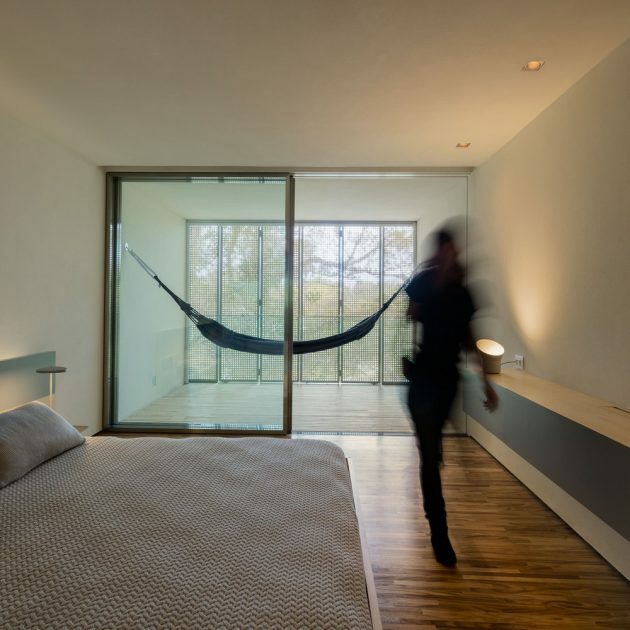 Thus, the architecture defined an inverted vertical organization of the program when compared to what is usually done in single-family houses: while the pool and the social areas are on the roof, the bedrooms are located on the floor below. The deck is on the ground floor- protected by the projection of the house – is an ample and generous space that configures a shaded shelter for the children to play. 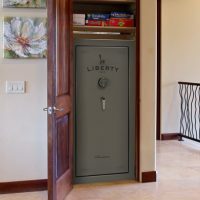 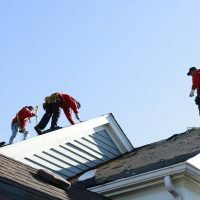 The utility rooms are also located on this story. 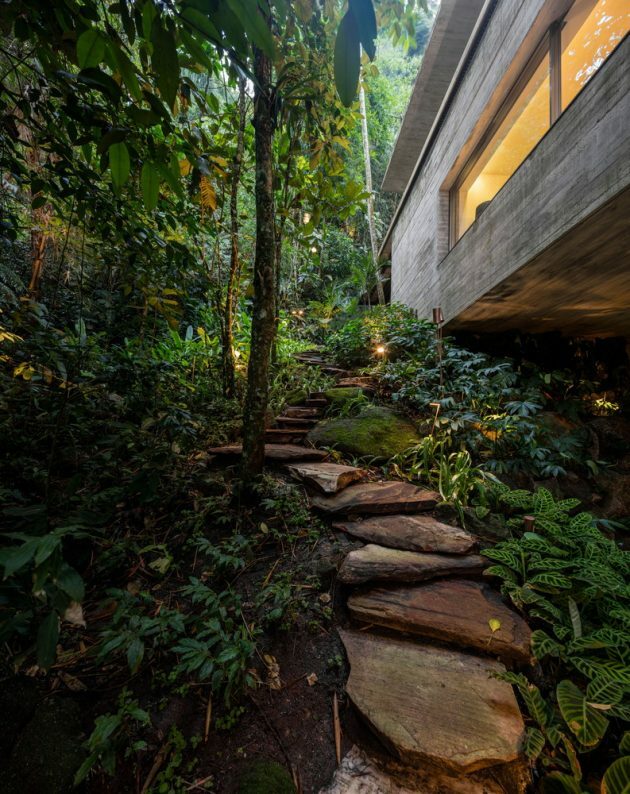 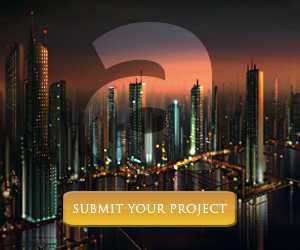 From the architects: “The landscape recomposes the native species. 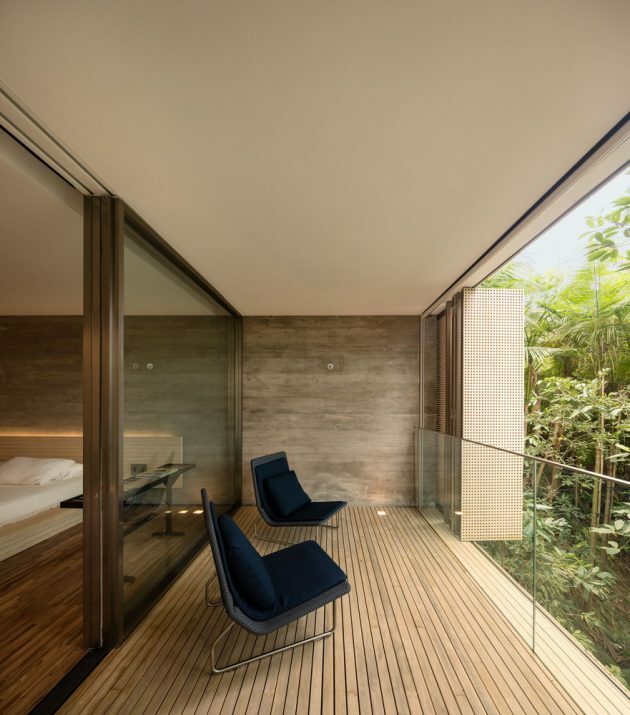 When one is in the house, the relationship with the surrounding vegetation occurs not only through the view but also through the plants that surround the wooden decks. 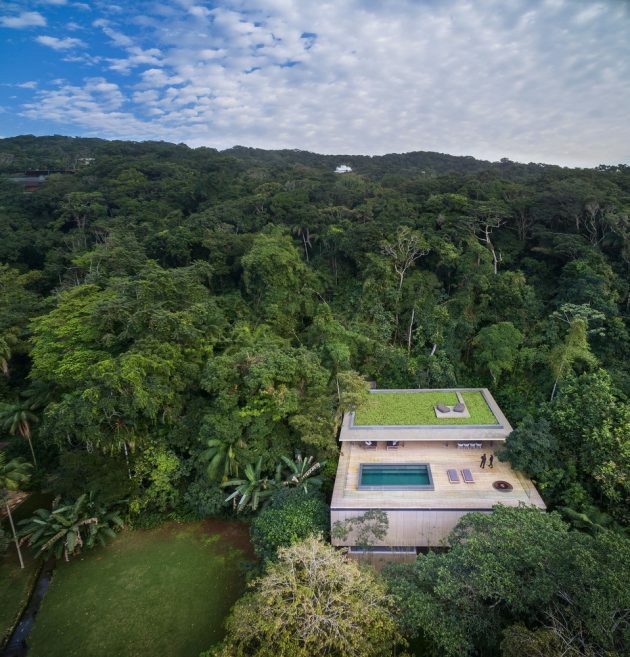 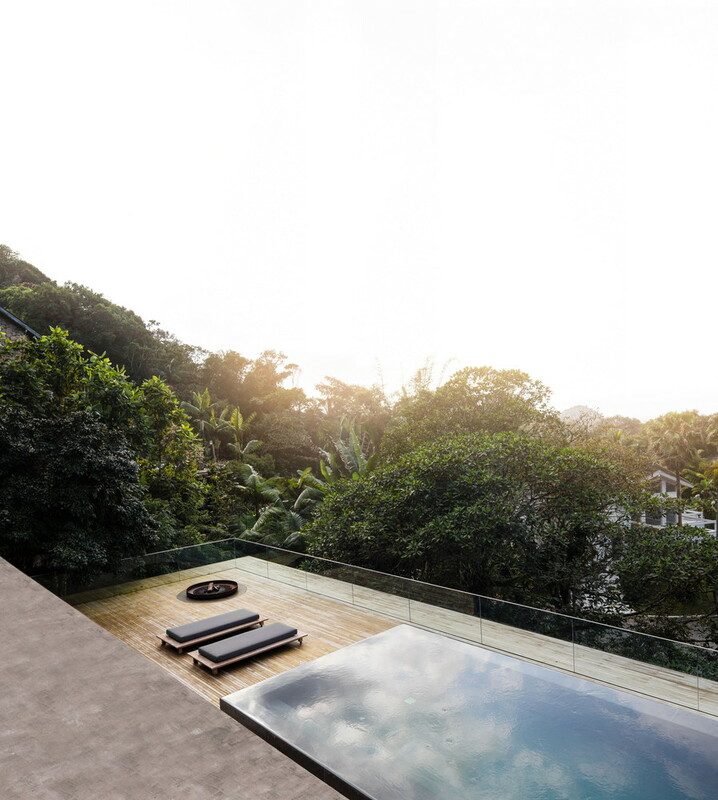 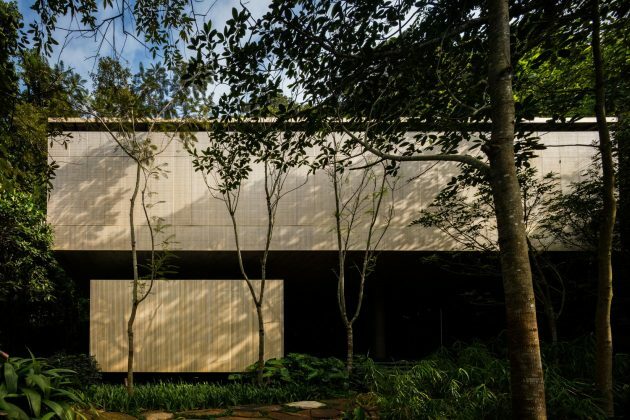 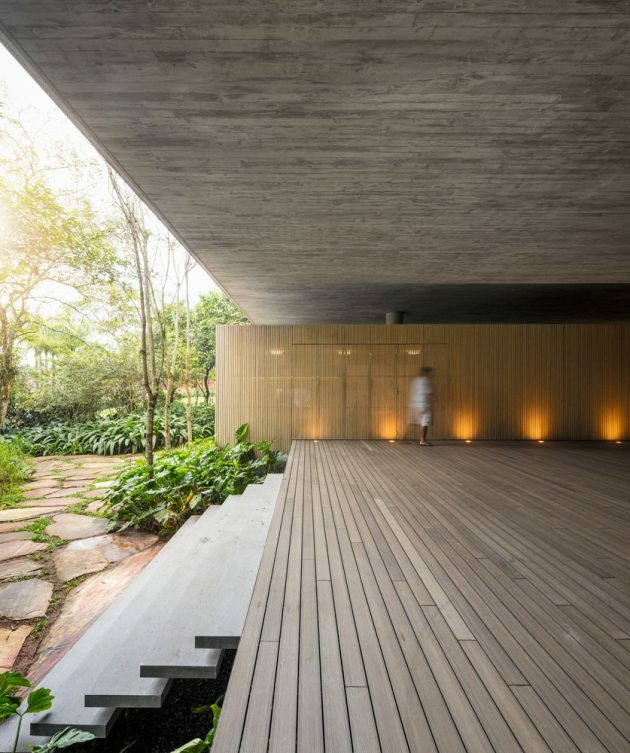 On the ground floor, you can stroll in the midst of trees; on the first floor, light enters filtered through the tree-tops; and on the roof, there is the vegetation with the ocean in the background. 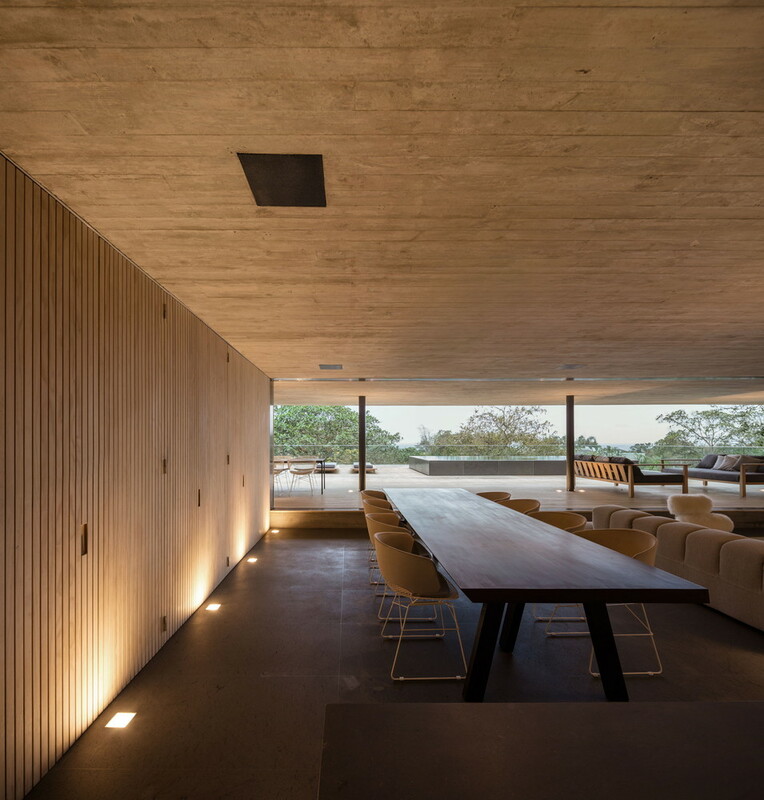 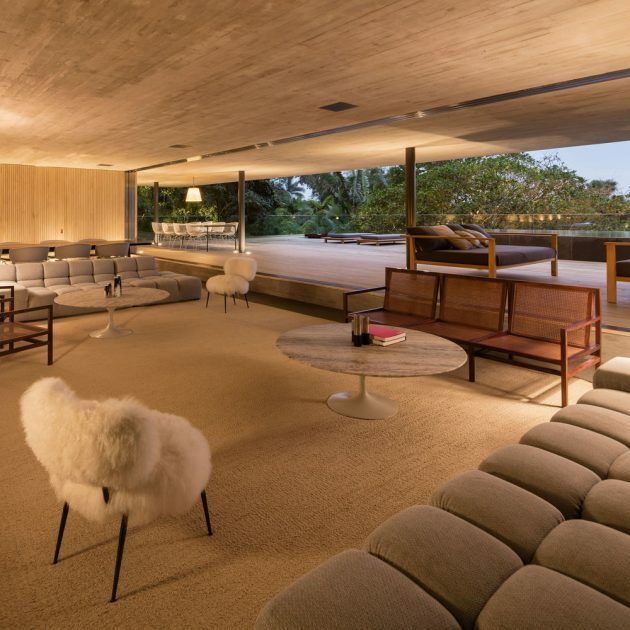 The architecture of the house privileged the use of exposed concrete and wood, as much in the interior spaces as well as the exterior. The bedrooms have wooden sun-screens, small brises-soleil, mounted as folding doors that can be manipulated by the users according to the climactic needs. 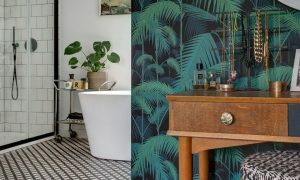 In the Jungle House, the project began with a transversal cut which allowed for the positioning of the pool to be semi-built-in to the slab thereby not losing any area on the floor below. Furthermore, the infinity pool as well as the raised border relative to the height of the deck makes it such that the view and the landscape serve as an extension of the pool waterline. 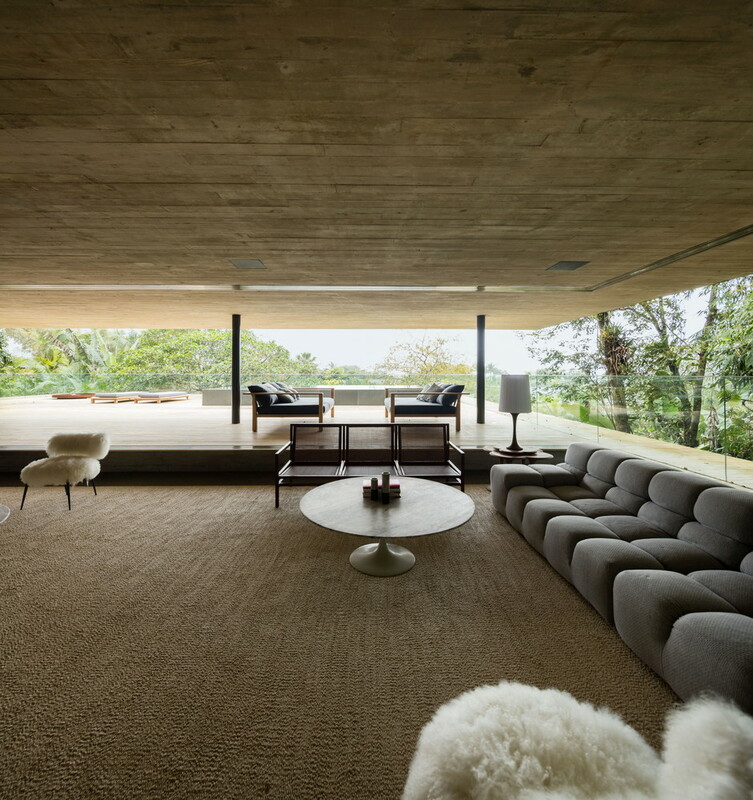 To lessen the height of the top floor and thus get an external proportion more horizontal to this volume, the floor in the living room was lowered by 27 cm relative to the external wooden deck.